What’s the deal with the Kardashian family and all of the paternity rumors? The latest nasty rumor has Kylie Jenner, the youngest child of Kardashian momager Kris Jenner and hubby Bruce Jenner. Tabloid gossip is that Kylie is *not* actually Bruce’s biological dad. Such language! Still, who can blame Kylie Jenner for using Twitter to make her point? What a hurtful, horrible rumor! It’s one thing when the nastiest of the Kardashain-related stories involve the adult children, but a 15 year old? Who does that?! Oh. Right. The tabloids. 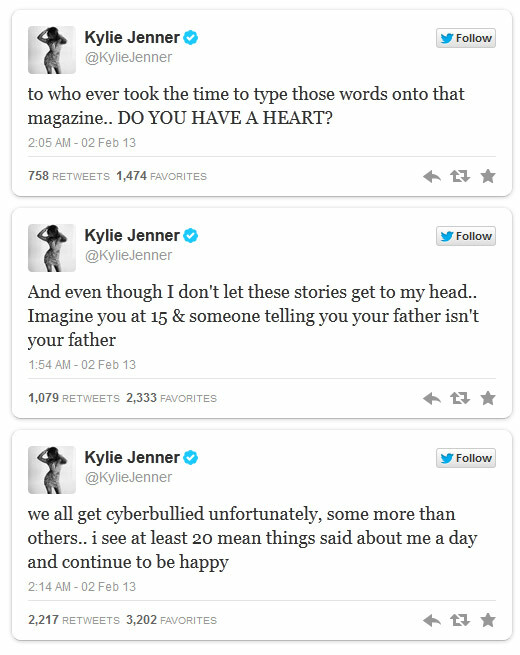 Kylie also went on to say that she gets cyber-bullied on a regular basis by haters, and she doesn’t let it get to her. Hopefully, Kylie Jenner will continue to let trashy stories involving her roll right off her back. Go Kylie!